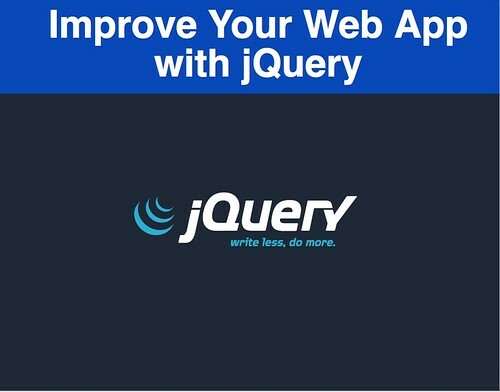 I gave a number of talks this spring on jQuery and especially on some of the recent additions made in jQuery 1.4. Below are all the slides and demos that I’ve given. 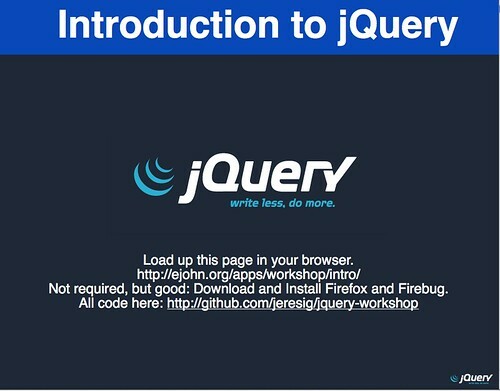 This workshop starts with an introduction to the fundamentals of jQuery (1 hour) and continues on with two pieces of hands-on coding (Todo list, 30 min, Social Networking Site, 1.5 hours). In the workshop I also had two pieces of hands-on coding. 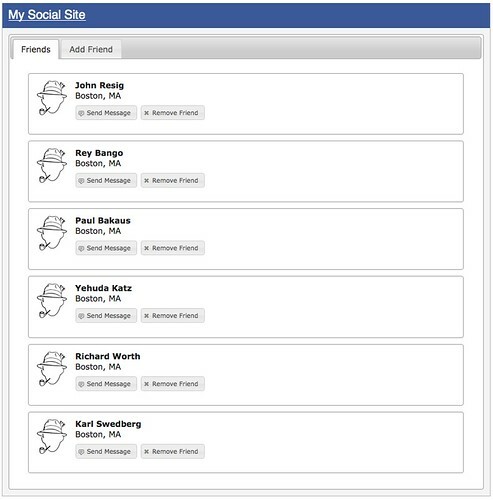 The first was an ajax-y todo list the second was converting a functional social networking site into a one page application (making significant use of jQuery UI). 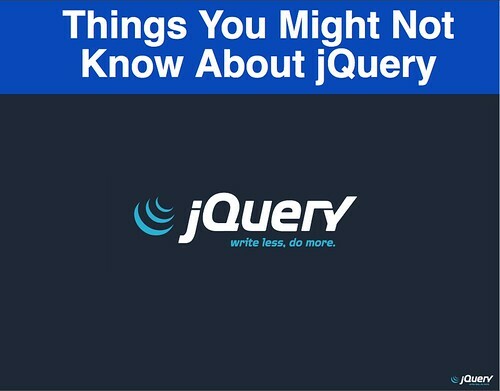 A variety of things that people don’t know about in jQuery – including new things added in jQuery 1.4 (and newer), data bindings, custom events, and special events. 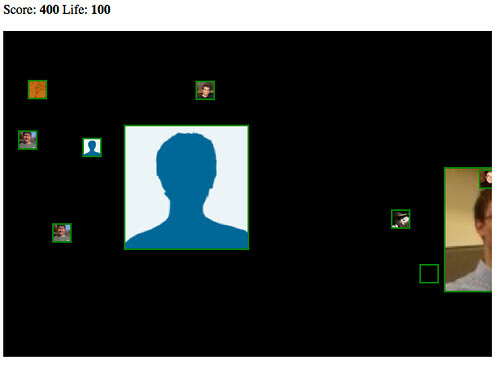 For the first jQuery Boston Meetup I built a game using the avatars of everyone in attendance. Sort of a space shooter style game you need to kick and kill the advancing hordes of users. I used this game as a way of demonstrating constructing an application that makes use of custom events, data binding, and building applications in an event-centric manner. 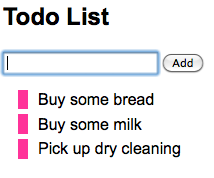 I’ve been messing around with a new piece of presentation software that I wrote for these talks. It’s still terribly crude and buggy (pretty much just got it working enough in order to run my talks in Firefox 3.6 and Chrome) – you’ve been warned. I hope to refine it at some point and release it for general consumption. Are you in fact going to be in Miami? This conference is in apparently in Europe. @JohnJ: I was already in Miami – the web site is already updated to reflect the next event (apparently in Europe). Thanks for posting these, John! Fantastic work. @Addy: I do use a modal dialog – you need to view the completed demo (click the url with ?action=done in it to view the completed one – it’s the one that I link to off of the screenshot). @Tarik: That’s a very specific location you have there :) Any conferences in Irvine? @R64: I know that there will be video of some of these talks coming (in particular the jQuery Meetup talk). I’ll post links to them on Twitter when they are released. Thanks for posting these John. I was just looking over the “Improved Creation” slide in “Things you might not know…”, and just tried it out. Small correction: I discovered that you need to specify “class” instead of “addClass”. Really diggin’ the presentation tool; I look forward to it’s release! Don’t know if you’ve tried to view these presentations on a netbook (1024×600) in Chrome 4.1 on Win 7 but you lose the last line of every “page” and if you try to compensate with Zoom > Smaller, you end up in an endless loop of repainting and history injection.